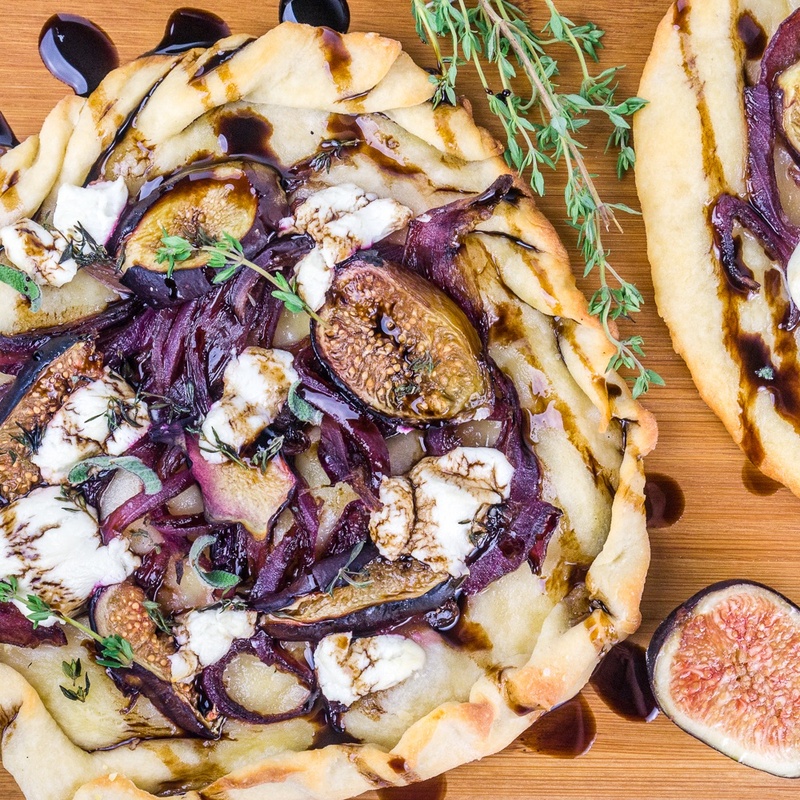 These Caramelized Onion Fig and Goat Cheese Flatbreads are made from scratch using the two-ingredient pizza dough. They are the perfect lunch or appetizer! Preheat oven to 400F. You'll need either a VERY large baking sheet or two large baking sheets. Sprinkle cornmeal all over the baking sheets to prevent the flatbreads from sticking. If not using cornmeal, make sure to oil the baking sheets well. In a microwave-safe bowl, combine the thinly sliced red onion and balsamic vinegar. Microwave for 6-8 minutes, stirring every 2 minutes. Set aside. In a large bowl combine the self rising flour and Greek yogurt. Mix with a fork until the mixture is all crumbly, then use your hands to work the dough until it becomes a smooth dough. You might need to add more flour to make the dough not sticky. Cut the dough into 2 equal pieces. On a large cutting board dusted with flour, roll each ball of dough into a 7-8 inch freeform flatbread. Transfer the flatbreads onto your baking sheets sprinkled with cornmeal. If you want, fold the edges of the flatbreads into pleats to create a thicker crust. You can also leave them as they are - flat. Brush each flatbread with olive oil. Top each flatbread with 1/4 of the onion, globs of goat cheese, fig slices, and fresh thyme leaves. Bake at 400F for 17-20 minutes. Remove from heat and drizzle with balsamic glaze. Top with additional fresh thyme or sage leaves and serve immediately.